I've been on here a long time and I've seen all kinds of posts about Movies, TV and Music. where the frustrated Sergeant would break down in tears and say "Everything happens to me!" Fiske, whose real name was Thomas Richard Potts left Hollywood to fight against the Nazi's in World War II. Mr. Potts was promoted to the rank of 2nd Lieutenant. He was killed in action on August 10, 1944 during the Battle For Brest in Operation Overlord. **Before the filming of the climactic pie fight, Curly went missing. Moe went to his dressing room and found him slumped in a chair. When Curly didn't answer, Moe realized that he'd had a stroke. It was the end of his career. Jerome Lester Howard passed away on January 18, 1952. Edited by Captain Kundalini, 25 March 2017 - 11:15 PM. Shemp's real name was Samuel Howard but his grandmother couldn't say "Sam". She instead said, "Shem" and that's how he got the name "Shemp". "Hey Moe, no wonder the water don't woik. These pipes are all clogged up with wires!" Oh my God! The poor Cook! The Three Stooges were so fun and so amazing!. How in the world did they not get seriously hurt with all the dangerous stunts in every episode! They DID get seriously hurt. Moe broke his ankle during the filming of one short. Larry really DID get a fountain pen stuck in his forehead. Edited by Captain Kundalini, 26 March 2017 - 03:03 AM. I have 487 Three Stooges sound bites and 35 videos. Moe, Larry, Curly, Shemp, Joe and Curly Joe. called "Slam Bang Theater" starring Icky Twerp. I liked Shemp. He was funny in his own way. Curly and Shemp each had their own separate style. Curly, Shemp and Moe were all brothers. Edited by Captain Kundalini, 26 March 2017 - 02:15 PM. This is the classic scene where Moe suffers from a concussion and several broken ribs. He completed the episode and was then hospitalized. I'm with you Captain, I loved Shemp and admired him looking for work outside of the Stooges, mind you he hated Healy. The most notable, even with it being short, is the sketch with W.C Fields as the bartender. Loved Curly as well. Depending on the day those two swapped being my favorite. In reality, Larry had a calloused cheek from Moe slapping him. Lady: "I must say, you're a most unusual dancer!" Curly: " I come from a family of dancers! My father died dancing.....ON THE END OF A ROPE!" Edited by EVP, 26 March 2017 - 09:13 PM. Wow, EVP... I believe you're right about that being the most violent episode! I of course realize that most of the props were rubber, etc.... but still a lot of dangerous interchanges going on. Whenever I need a good laugh, I give a listen to this sound byte. The Boys are supposed to fire a Shell filled with laughing gas at the enemy. and it comes down on top of them. I think this appeals more to the male species. Ha ha!! My husband loves the 3 Stooges. I would rather watch paint dry than them. I love The Three Stooges. I'd watch them every Saturday morning on my local TV station. Also on New Years Eve, they'd run a Three Stooges marathon. 24 hours of nonstop hi-jinks and hilarity. (Hands you a bucket of paint and a paint brush after morphing into Moe. All the women I've known just don't get the Stooges. Obviously it's a gender thing, but I wonder why? Vlawde, You can't lump all of us females together. 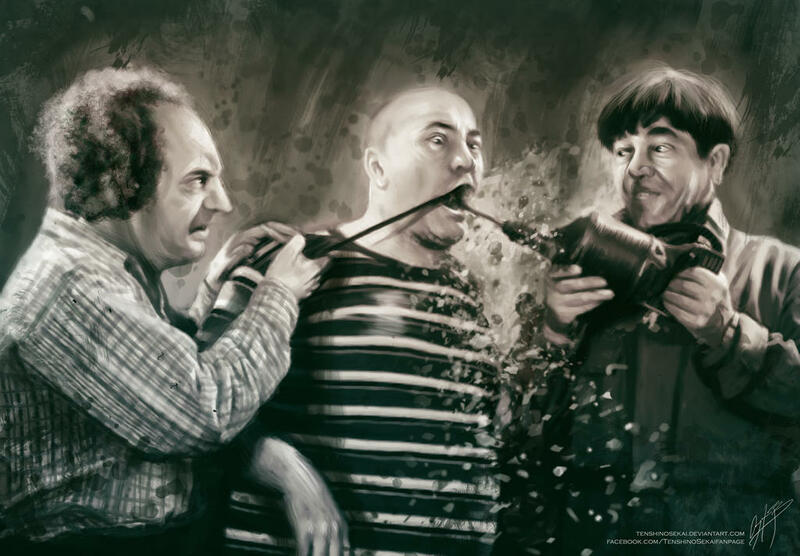 I grew up watching the Three Stooges, even their cartoon version. Carrie, my girlfriend likes The Three Stooges. I blame this all on Lorac!